The United Arab Emirates (UAE) is known for its desert climate and year-round sunshine, but freak weather conditions have covered part of it in snow. And as if that wasn’t weird enough, heavy winds also caused a crane to collapse, sparking a fire. One person was injured in the blaze following the crane collapse on Dubai’s busy Sheikh Zayed Road, according to officials cited by AFP. Three vehicles were also destroyed in the fire. The incident prompted the Dubai Roads and Transport Authority to briefly suspend part of the city’s metro service as a “safety precaution” due to falling debris on the tracks. Authorities also urged motorists to drive carefully on the road, after the National Center for Meteorology and Seismology (NCMS) warned of increasing winds and poor visibility. Winds reached between 75 and 80kph (45 and 50mph) across the UAE, which was also hit by rough seas. 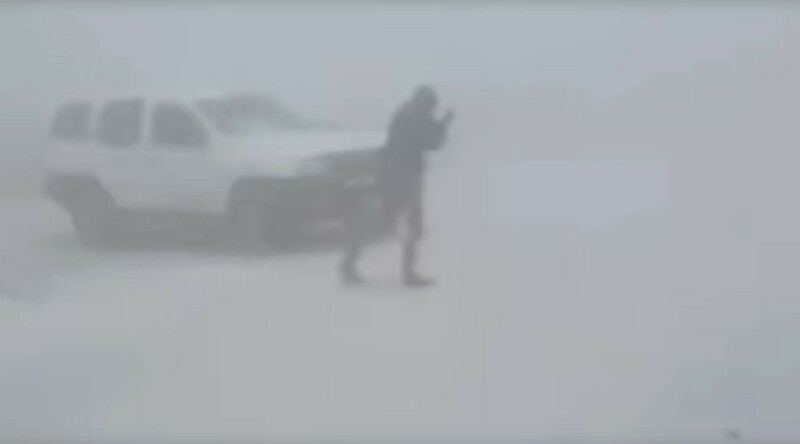 A rare 10cm (3.9 inches) of snow landed in the area of Jebel Jais, the UAE’s highest mountain, Gulf News reported. Temperatures also plummeted between -2°C (28.4°F) and -3°C (26.6°F) in the area. #JebelJais covered in 10cm of #snow as temperatures reach -2.2 degree Celsius in the #UAE's tallest mountain today. But the below-freezing temperatures didn’t stop locals from going outside to build a few snowmen – Emirati style. The winter fun doesn’t mean the snow didn’t come as a shock. One Twitter user joked that the freak weather had caused her to reevaluate all her beliefs. It is not, however, the first time that Jebel Jais, which sits at a height of 5,700 feet, has seen snow – it experienced a lighter snowfall back in December 2004.